You can live a better life through movement. At Spiral Spine Pilates we inspire our clients to live the life they want. We believe that movement is often the missing piece to loving your life and achieving your goals. No matter what challenges you, be it scoliosis or a sore knee, our Pilates instructors can help you ignite the path to a new life. Ready to get started? Whether you have a specific body issue or simply desire an instructor’s undivided attention, you’ll want to book a private lesson. Take a look at the instructor bios to find the right teacher to meet your individual needs. Virtual lessons are also available with Erin Myers. The rates are the same as her other private appointments. For information on how to schedule a virtual appointment, please email clientcare@spiralspine.com. Classes utilize the 3-in-1 Reformer, Mat Station and Tower, Chair, and Pilates Arc creating a highly effective system for all fitness levels. Classes are capped at six clients, allowing instructors to address each client’s needs and modifications. Wear something you feel comfortable moving in. Capris and long workout pants are great, but no short running shorts please. Socks or bare feet are fine. I’m a beginner. How do I start? 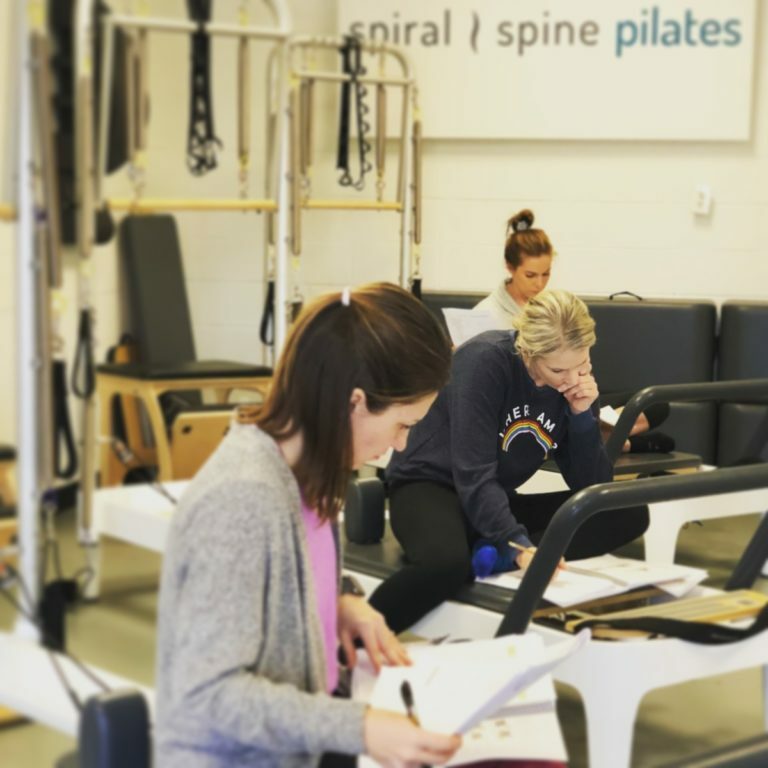 If this is your first time trying Pilates, we highly recommend that you start by scheduling a private lesson with an instructor who can help develop an individualized training plan for you. Afterwards, you can certainly continue with private instruction or move into a group class. Can I take Pilates if I have a special issue with my body? Absolutely! Our staff specializes in developing programs and exercise modifications for clients dealing with injuries and other physical issues (i.e. 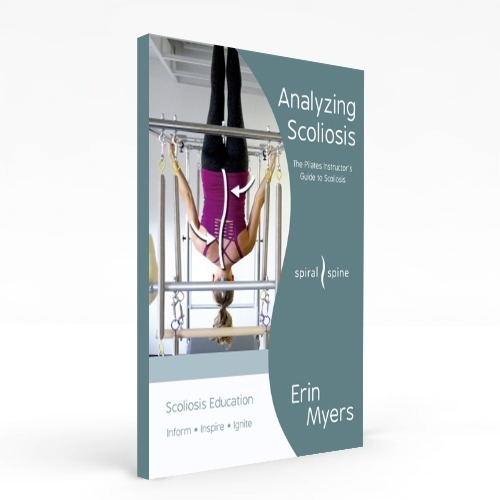 scoliosis, lower back issues, and pregnancy). Please book a private appointment first so you can learn appropriate modifications before booking a group class. All classes are 50 minutes. For both group classes and private instruction, please register here to schedule your lesson. You’re welcome to contact the studio if you need assistance registering. If you must cancel your scheduled class, please do so 24 hours in advance to avoid a full-service charge. While we understand that unforeseeable circumstances and illnesses do occur, our 24-hour cancellation policy remains in place. Do you offer virtual lessons if I’m not able to come to the studio? Yes! Erin offers private, virtual lessons at the same rate as her private appointments. For information on how to schedule a virtual lesson, please contact the studio. At Spiral Spine Pilates, client satisfaction and specialized attention set us apart. Our staff is hand-picked by Erin, and clients are carefully matched with the instructor that will best meet their needs and goals. "I’ve played the game of golf for almost 40 years and am a Class A PGA Golf Professional. Before I started working privately with Erin, I was honestly on the verge of putting my golf clubs away for good. My low back was really hurting and I’d lost the ability to properly rotate my hips, which terribly affected my golf game. Tying my shoes was a chore and I did not truly understand how poorly my body was actually moving. I had become used to living with pain. "I started working privately with Erin and she helped me to understand why my body was not moving and performing properly in my golf swing. She is so knowledgeable. Erin is extremely focused and brings great excitement and dedication to my highly personalized private lessons. My golf game is improving, but most of all I feel so much better in all aspects of my daily life. I’m in less pain and feel much healthier. I highly recommend Erin and her team at Spiral Spine Pilates. They will definitely help you if you are willing to put in the hard work!" Excellent place! I love the instructors - they are very knowledgeable and great to work with. I never thought I would say I looked forward to exercise, but I really do. My back has not felt better, and I feel great especially for my age. I highly recommend them! Because of the small class size and general one on one interest of every instructor with their clients, I really feel like I am wanted here and cared for and not just a random client in a huge class. My back has felt the best it has ever felt after one session. I totally forgot to take my anti-inflammatory the night of the class because I did not notice the pain at all! I love Pilates! I enjoyed it before I was pregnant and am also really enjoying it now that I am six months pregnant. I think it is relaxing and fun! For someone who does not enjoy working out, this is something I love and look forward to. I can see a huge difference in my dancing by doing Pilates. My flexibility has improved by 75%, my strength and endurance is higher, I experience less injury, and my turns and movements are so much quicker and sharper thanks to the strength that I have developed in my core. The best part about our classes is they are always different and that keeps me wanting to come back for the next class! I feel stronger and my endurance level has increased. I have tried other forms of exercise and I like Pilates better than anything else I have done. The instructors rock! As a runner, I never stretched properly and Pilates has helped me to balance my body and in turn make me a better, stronger runner. Whenever I walk out of a Pilates class I feel taller, longer, and stronger! Interested in Pilates teacher training? We offer Balanced Body Pilates teacher training at the Spiral Spine Pilates Studio in Brentwood, Tennessee.